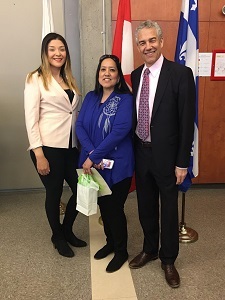 “Every story has a beginning, a middle, and end,” said Sarah Lane, a student of West Island Career Centre’s Auto Mechanics Program, and an Adult Learner honoree. This year’s Adult Learners Gala, the culmination of Adult Learners Week, was a collection of inspiring and moving stories, and a recognition of the literal and symbolic journeys followed. It’s hard to put the impact of the Adult Learners Gala into words. At the gala, students from all of LBPSB vocational and adult centres bravely and humbly share their experiences to a packed boardroom of teachers, family, friends, supporters, and distinguished guests. As the celebration began it became clear that the Adult Learners Gala would become a story in and of itself. Michael Chechile, Director General of LBPSB kicked off the proceedings with words of encouragement and congratulations. Mr. Chechile also carried the theme of storytelling through as he explained that personal stories are more symbolic and carry more weight than any grade or diploma. 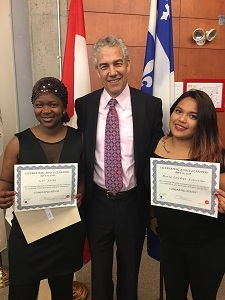 Frank Baylis, Member of Parliament representing Pierrefonds-Dollard then took to the stage to honour the adult learners’ strength through obstacles, and commend them for reaching this major milestone. The applause, cheers, (and even some tears) reached a crescendo when the Adult Learners took to the podium. Representatives from each center recounted their journeys towards adult education. For some, the decision process was particularly trying. The Adult Learners were incredibly honest and candid. While each story and student is unique, there were 2 common themes: perseverance and support. Every honouree spoke of the incredible support and guidance they received from their teachers, administrators, family and friends. They all worked so hard, but they didn’t do it alone. The sense of community was palpable. The conclusion of the gala was marked by new beginnings. The Adult Learners gala was only one step in lifelong education. Following the ceremony a reception was held where new friendships and partnerships were formed, discoveries and interests were planted, and teachers/administrators caught up with their students. Congratulations to all Adult Learners and their supporters. We’re so proud of you!